Infinity scarves are different from standard scarves because they have no beginning and no end. They consist of one large loop that wraps around your neck once, twice or three times in order to create a warm and cozy looking wrap that doesn’t run the risk of unraveling. They are stylish and easy to manage accessory that works well on men and women of all ages. 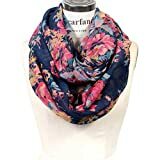 If you are someone who avoids scarves because you don’t know how to tie them, hate dealing with loose ends, or just haven’t found one that’s comfortable for you, then consider an infinity scarf! Below are the top three infinity scarves for women and men; a stylish one, a warm one, and a sporty one. So no matter what you like to do in fall, be it snap some Instagram shots, fight off the chill, or get in your workout, you can don an infinity scarf. So stay cozy this fall with this fantastic accessory. This scarf is lightweight and comes in a variety of attractive floral prints. Consider it a necklace that keeps you warm! It can pull a whole fall look together. The fabric is thin and translucent, which creates a nice transparent layering effect, and the circumference is 70”, which means you can easily wrap it around your neck twice. It is great for spring or fall since it will keep you warm without heating you up too much – it can help you to fight the chill in a breezy, lightweight way. The beautiful patterns mean you can pair it with a variety of outfits, and the color choices mean you can definitely find a scarf that works for your personal taste. Infinity scarves are great for winter because they can be wrapped tightly to fit snugly against your neck. This one is made in a warm and cozy material that is bound to keep you feeling cozy. It comes in an attractive oatmeal color that will match the majority of your wardrobe and has a few pops of color in the knitting that will make your outfit fun and distinctive. Its circumference is 61 inches, so you can wrap it around yourself twice. 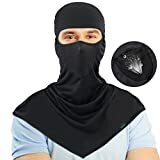 It is a full 12 inches wide so it will easily cover all of your exposed skin, even if you are wearing a low cut shirt or sweater under your coat. This scarf will help you to stay cozy, warm, and looking great all winter long! Infinity scarves are great for anyone who doesn’t want some cold weather to interrupt their running routine. They won’t unravel around your neck, and if you buy the right one, they can keep you warm without making you wet with your own sweat. It is made of 50% bamboo and 50% polyester and has a small zippered pocket that’s great for storing keys or even a smartphone while you are running. It measures 70” x 14”, so you can comfortably wrap it around your neck twice to keep out the chill. This is a fantastic solution for anyone wanting to walk, hike, or run in chilly weather. This infinity scarf is great for men looking to add a touch of classic style to their fall or winter outfit. It comes in a plaid pattern in muted, neutral colors, and at 68” around, it can easily wrap around your neck twice. This can elevate a casual look, fit in with a business casual outfit, or even add a touch of cold weather style to business or formal attire. The fabric is lightweight, so it won’t make you hot, but it will keep the breeze away. It comes in several color options, so you can find one to best suit your wardrobe. This chunky, oversized infinity scarf is smaller than the rest. With a 28” circumference, it will only fit around your neck once, but it will fit snugly enough to keep you warm without strangling you. It has a classic, knit style that both looks minimalist and classic. If you are facing some seriously cold weather, you can stretch the acrylic to wrap around your neck tightly, effectively locking your body heat against your body and combating cold winter air. It is also wide enough to stretch into a hood to protect your head and ears. The navy blue color will match most of your winter wardrobe, and you are sure to be so cozy that you won’t want to remove the scarf, even indoors. This neck wrap is great for anyone looking to go for a jog without wearing a coat or a turtleneck. It fits snugly over your head and sits tightly around your neck without wrapping at all. This infinity scarf is made of super soft fabric that is windproof and cooling, so you can keep off the breeze without freezing in your own sweat. It can even be stretched up over the mouth and nose to keep your face warm during the colder months. One outdoorsman left it a glowing review, stating that it stays put and is great when he walks his dog!